Energy saving lightbulbs are harder to find and more expensive in low-income U.S. communities than in more affluent areas, according to a new study from the University of Michigan. 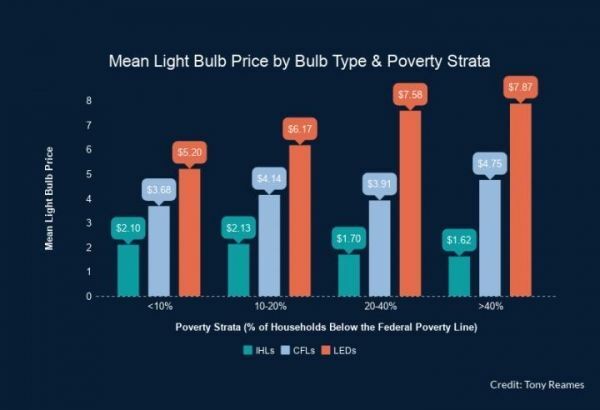 The cost for households to upgrade from incandescent to LED bulbs, for example, was two times higher in low-income neighborhoods. For the study, researchers at the Urban Energy Justice Lab visited 130 stores in Wayne County, Michigan, the state’s most populous county, covering Detroit and its surrounding suburbs. Study sites included big-box retailers such as Home Depot and Walmart; hardware stores; variety stores such as Dollar General; pharmacies; and small retail stores such as corner delis, mini marts, and liquor stores, reported Greentech Media. Researchers found low-income neighborhoods largely lacked big-box stores that might carry LED and CFL bulbs at lower prices. Most small stores in these areas didn’t carry energy saving bulbs at all. In those few stores that did, there was a $6.24 mean price difference between incandescent and halogen bulbs and LED replacements, “a huge upfront cost in areas where 40 percent or more of the households live in poverty and roughly 27 percent do not have access to a personal vehicle,” the researchers wrote in the study, published this month in the journal Applied Energy.